It’s that time of the year again. Time for noise makers, popping corks, and quiet moments of retrospection by the fireside. Just shoveled out the BBQ area today, and it’s looking good. It only snowed a few inches. Tidy and well-kept, it is ready for action. Ready for some New Years Day pork ribs, and Boston butts. Anyhow, as I take a sip of tea, I find myself rummaging backwards in time through the annals of my memory, in particular, the many BBQ moments and cook outs often tallied on these cyber pages. It was another very good year at the pit. I think we averaged about once a week, year round. No matter what the outside temperature. No matter the weather. We stood stalwart at our pits, patron to the gently curling plumes of hickory smoke. In retrospection, I should like to favor you with some of our favorites culinary forays from the past year in the BBQ arts. Or at least the ones that stand out to us as remarkable, and worth mentioning again. The first, I guess, being the beaver. Yes, aquatic rodent. You read that right. We ate one, oh, a little less than a year ago. That was a different sort of endeavor, I don’t mind telling you, but hey, we’re always up for a new challenge. We barbecued that thing just as kindly as we knew how. Dusted in rub, swaddled in foil, we ushered the odd but savory meat to what we declared a decidedly succulent end game. Turned out better than we hoped, and we didn’t hope for much. It looked akin to pulled beef, and didn’t taste far off from it either. Oddest BBQ Award goes to the beaver! On occasion here at the pit, we fancy to do a review or two. But we usually only do such with stuff we really like. Because we could say yes, I suppose, to every buckaroo that hits up our inbox, but if their product stinks, well we’ve just wasted your time. So we try and only review the best of the best. Looking back, I think our most favorite piece of outdoor cooking equipment we reviewed this year has got to be, hands down, the Mojoe Griddle. 35 pounds of restaurant grade hot-rolled steel, nearly stick free, and oh what a pleasure to cook on, patron to the pit. When you’re not cooking with it, and if by chance you should find yourself in the heady crossfire of a gunfight, you can tip this griddle on edge and hunker behind it for blast protection. When the battle is finished, you can flip it back up and make pancakes for every one. We loved this griddle. And our Editor’s Choice Award for the year, goes to the Mojoe Griddle. Truly, the best of the best. A great many spice rubs also come our way in a given year. Some that we buy, some that we make from scratch, and some that are sent to us by people who create them. Our surprise favorite spice rubs this year all came from our readership, and one reader in particular nailed it the best. Miner’s Mix. They challenged us to try a “real rub”, and sent us some samples. And we were blown away. Clean ingredients, great flavor, and even better people. We’re still trying out their many flavors, but if you’re looking for that next great rub to add to your larder, it don’t get much better than these cats. Our Favorite Spice Rub Review of 2015 goes to the good folks at Miners Mix. We also had occasion to test out some mighty nice cast iron. Cast iron and cooking, especially grilling, is a marriage conceived straight from heaven. And one of the best upgrades you can make to your standard Weber kettle grill, is to grace it with a cast iron grate. One to last the eons, and give you those all impressive char marks. But it gets better. If you’re lucky enough to have a grate from the folks at Craycort, you also get to play with cool inserts. Our Favorite Cast Iron Accessory we tried this year, no doubt, was the cast iron pan insert for the Craycort grill. That thing was all too pleasant, and more than enough fun for a pit jockey proper. It’s pie shaped robustness slips nicely into place, merging with the main grate to create a symphony of cooking options for your grill. What a great idea, and a tip of our BBQ hat to the good people at Craycort for offering such coolness. Somewhere along the way it rained. Lots of places across this beautiful globe get their wet seasons I’m sure, and Minnesota was no exception this year. We had a soggy stretch where it must have rained for 14 days straight. Such enduring weather would send most folk indoors to stare glumly out the window, but not a patron of the pit. Nay, we simply erected an old, blue tarp and carried on as usual. Thinking back over a year of BBQ, of all the umpteen cook outs, one beef rib smoke in the rain comes to mind as maybe our most favorite smoking sortie of 2015. There was just something keenly pleasant about roosting under a well-strung tarpaulin in a rain storm. Something quite therapeutic about it that which melted straight into the soul. The infinite drumming of the rain drops over head, whilst the hickory smoke silently pillared from the damper on the old weber smokey mountain. Not exactly sure what it was, but it was perfect even so. Hard to articulate, but easy to appreciate. Our Favorite Smoke of 2015 goes to the Rainy Day Beef Ribs. And oh yes, they hit the gastronomic bulls-eye! Every once in a while, we like to venture away from base camp, and bring you something a little different. To go somewhere, and do something BBQ related. Well, it didn’t take much retrospection to find the most different thing we did this year. Dating way back to last winter, in point of fact, we loaded up our cameras, downy jackets, and headed north to the Fire on Ice BBQ Competition. The only BBQ competition in the world that we know of to be orchestrated over 4 feet of ice. It was a giddy experience shuffling past all the many custom pits lined up so neatly on the ice, forming the hallowed “BBQ Alley”. If you ever get the hankering to smoke a beef brisket whilst pulling a walleye up through a hole in the ice, this is the place. 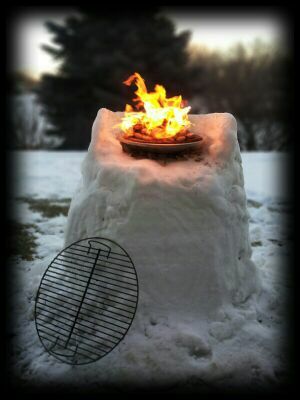 The Coolest BBQ Road Trip goes to the Fire on Ice BBQ Competition. As I toss another log on the fire and warm up my tea a bit, I find there has been a vast many pleasantries, BBQ-wise, to come our way this year. Plenty to be thankful for. We’ve been undeniably blessed. 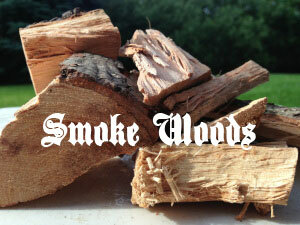 Many good memories gently forged in the company of orange glowing coals and soft tendrils of wood smoke. The best memories tho, are not of ribs, or steak, or perfectly executed pork shoulder. Nor do they hail from all the cool toys a patron of the pit gets to play with. Nay, the best memories are of the people. Of you guys. Those lovely souls who often sidle by, if for nothing else, than just to say hi. You are our prized brisket. The true gems of the pit. So, a kindly and sincere thanks to the readership, and the regulars who frequent these online accounts. Who give lift to our airfoil in the cold vacuum of cyber space. We thank you for putting up with us, and tuning in so faithfully. We love to BBQ, and we love to tell you about it. To butcher the late, Robert Traver’s fly fishing tome, with BBQ in place of fishing – it isn’t that we regard BBQ as being so important, but it’s just that so many other things in life are just as unimportant, and not nearly so much fun. Amen. This entry was posted on December 31, 2015 by Patrons of the Pit. It was filed under Uncategorized and was tagged with bbq, camping, cooking, fishing, food, foodie, grilling, outdoor cooking, writing. Thank you for another year of “pitiful” words (if you’ll allow the pun). Cheers to you, sir, and Merry New Year! Nice one, Todd! You ought to be a writer someday! Like wise, my friend, thanks for turning into an awesome regular. Party on! You are master of the prose. !! HNY from Nashville, TN !! HNY to Brian in Nashville! Many thanks sir! Happy New Year back to you! And congrats on your 4th year of blogging. You do great work over there! Well said, my friend. All the great food, discoveries, and adventures would be far less memorable were they not shared with friends. Although we may never meet in person, we count you as a friend and look forward to another year of sharing life’s adventures with you! God bless you and your family throughout 2116. Absolutely. Well I’ve always believed that the Lord designed people for fellowship, and man when you get that doing something you love, well that’s a pretty good thing indeed. We count you as friends too, John and Mary in Ecuador. Even when you rub in your suntan lotion a little too happily! Ribs look great! Nice smoke ring. Why thank you, Chef! Hats off to low and slow! Happy new year! As always, you guys are wonderful. 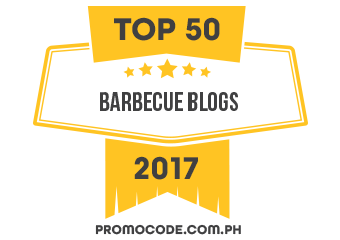 Great blog, and thank you so much for the kind mentions!! Wishing you the very best New Year!! Our pleasure. You guys are great too. Thanks for all the spices! And the best of New Years to you likewise.